Bonhams Australia have thrown down the gauntlet to other auction houses with an ambitious two catalogue sale of Aboriginal art taking place in Sydney on the 28th of May. A total of 195 lots will be offered in two parts consisting of a wide variety of paintings, carvings and artefacts including a number of items estimated to fetch $100,000+ which suggests that Bonhams are relatively confident that collectors and investors are regaining confidence in the market for Aboriginal art. The estimates provided by Bonhams are quite enticing and offer collectors and investors an opportunity to acquire a museum quality work at a very reasonable price. Although most works are fresh to auction, a number have been previously offered for sale previously. Most notably, lot 159, a major work by Deaf Tommy Mungatopi estimated to fetch AU$50,000 - 70,000, was sold at Sotheby’s Melbourne in 2007 for a hammer price of AU$80,000 against an estimate of AUD 30,000 - 40,000. The first part of the sale consists of works from the superannuation fund of art dealers William Nuttall and Annette Reeves who developed the collection over a 20 year period. Nuttall and Reeves, co-directors of Melbourne based Niagara Galleries, made the decision to sell the entire collection after changes were made to the laws governing superannuation funds which would make managing the collection even more expensive and time consuming. The Nuttall/Reeves catalogue has 120 lots with estimates ranging from a few hundred dollars to $50,000+. 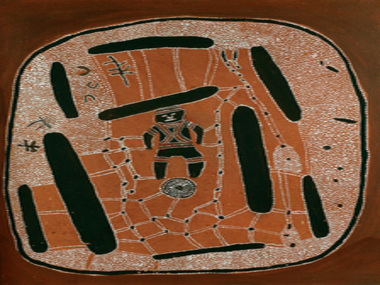 Highlights include lot 30, a painting on composition board by Shorty Lungkata Tjungurrayi (1920-1987) titled Children's Story which has been given an estimate of AU$40,000 - 60,000 and lot 33, a natural earth pigments and natural binder (bush gum) on plywood titled Lissadel Ceremonial Figures by Paddy Jaminji (circa 1912-1996) estimated to sell for AU$18,000 - 25,000. Also of interest is lot 12, a large untitled painting by Emily Kngwarreye estimated at AU$ 10,000 - 15,000 and a major painting by Turkey Tolson Tjupurrula (circa 1938-2001) depicting the secret cave site of Mitukatjirri which is expected to fetch AU$30,000 - 50,000. The second catalogue of the sale consists of 74 lots from multiple vendors and features a number of spectacular and highly desirable paintings by some of the most sought-after Aboriginal artists including Paddy Bedford, Rover Thomas, Ginger Riley and Eubena Nampitjin. Leading the general Aboriginal art sale is lot 168, a wonderful large minimalist painting by Paddy Bedford titled Thoonbi, 2006 which is fresh to market and estimated to bring AU$ 150,000 - 180,000. The second highest estimate of AU$ 100,000 - 150,000 has been given to Johnny Warangkula Tjupurrula’s Water Dreaming with Bush Tucker which was painted for Geoffrey Bardon in 1972. Sure to generate lots of interest is the cover lot, lot 159, a spectacular natural earth pigments on eucalyptus bark painting by Deaf Tommy Mungatopi (circa 1925-1985) which has been given an estimate of AU$50,000 - 70,000. Another highlight of the sale is a rare carved and engraved Broad Shield from South East Australia being sold as lot 134 and with an estimate of AU$ 20,000 - 30,000.